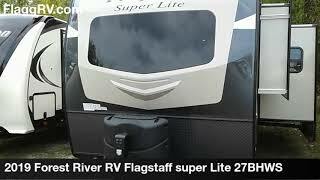 Hi, I am interested in your 2019 Forest River Flagstaff (stock #59931) listed on Autotrader for $31,995. I'd like to get more information about this vehicle and confirm its availability. This Flagstaff Super Lite travel trailer is loaded with all of the amenities you need, yet light weight making it a breeze to tow! Before you enter come check out the exterior features. You will enjoy the convenience of the outside kitchen with a pull-out cooktop and a refrigerator. Nearby there is also a gas grill. The drop frame pass-through storage area is ideal for your larger items such as an outdoor mat, bags of charcoal, firewood and such. Inside your kids can sleep comfortably on the double size bunks, and mom and dad will enjoy the private front bedroom with a Serta queen bed, a second slide including a wardrobe, and an optional TV and carpet if you like. You can also cook and shower in this trailer, no more hotel expenses or public facilities needed!